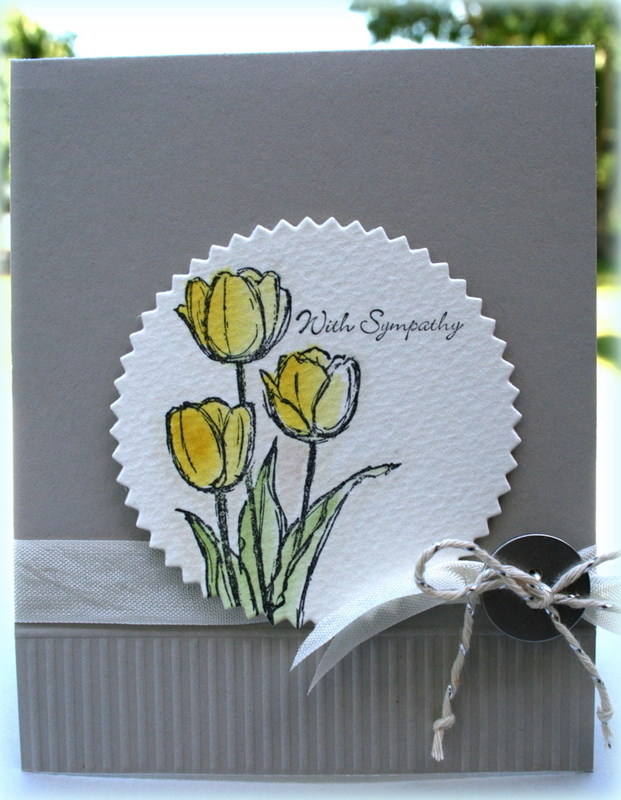 Last week, I had to quickly make a sympathy card…and I ask myself, why don’t I have a stash of sympathy cards on hand so I can just get one out and send it? Doesn’t happen at my place ..I guess, because I like to make a sympathy card to reflect the person I’m sending it to? Does that make sense? What do you do? Here’s my card. ……I made a CAS card! (that doesn’t happen very often!) . Ive used Sahara sand as my base card and used my score tool down the bottom. The stamps are Blessed Easter (I dont often send Easter cards) so I cut the sentiment off on this set. I also used teeny tiny sentiments. I used stazon to stamp onto our gorgeous water colour paper and coloured in with Daffodil Delight and Wild Wasabi. The Starburst framelits are often out on my crafting table..love them! The silver twine and the new silver buttons are great too..I’m a bit of a button hoarder (‘My Precious’) but, I will be trying to let go and actually use these buttons as they are yummo! Hehehe! A lovely sympathy card and a great use of this stamp. I love the scoring you have added to the bottom of the card. Thanks Paula yeah unfortunately gotta make another this week ..not a good week! Two funerals in two weeks!